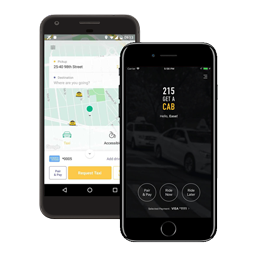 215-Get-A-Cab is Philadelphia's premier taxicab dispatch company, offering the city's largest fleet of technologically advanced taxicabs. We offer fast, friendly and reliable taxi dispatch services. Whether you need a cab now or want to book in advance, 215-Get-A-Cab helps you get to your destination quickly and easily! We serve customers throughout the city and offer wheelchair accessible vehicles as well as sedans, SUVs and minivans. No credit card is required and never any cancellation fees or surge pricing! 215GetACab is the new e-hailing app for Philadelphia's best taxicab dispatch company. Now Philly's largest fleet of taxicabs is at your fingertips! The 215GetACab app connects you to fast, reliable and friendly service 24/7! Whether you need a cab now or want to book in advance, 215GetACab helps you get to your destination simply and efficiently. Just tap and go! No credit card required and never any surge pricing or cancellation fees! Use this form to order a taxicab at least 24 hours in advance. If you need a cab now, get the free app or call 215-GET-A-CAB. How Much Do Taxicabs Charge In Philadelphia? Rates are set by the Philadelphia Parking Authority so you never have to worry about surge pricing! Please check the Philadelphia Parking Authority's website for this month's fuel surcharge.